Home » Founder vs. Flounder – What’s the Difference? Have you ever hooked a fish and reeled it in, only to have it flop pitifully around on the dock or in your boat until someone’s daughter started crying and you had to throw it back? That lucky fish was floundering, which earned it enough sympathy to live another day. Or was it foundering? These two words have related meanings, but there are actually separate usage cases for each. Founder has a long history that stretches back to before English was a widely spoken language, while flounder is interesting for its own reasons. What is the Difference Between Founder and Flounder? In this post, I will compare founder vs. flounder. I will use each word in an example sentence that shows it in its proper context, and I will also show you a memory tool that makes choosing founder or flounder easier for your own writing. What does founder mean? Founder has several meanings, one of which is a person who started something. Ray Kroc is the founder of Mcdonald’s. In this post, however, I will focus on its use as a verb that means to fail or collapse. Founder has a long etymological history that stretches through Middle English and Anglo-French all the way back to Vulgar Latin. It has always been related to falling to the bottom, or simply the bottom. Here are a few English sentences that make use of founder. My earnest attempt to take over the world foundered when I discovered that I lacked the military might to invade other countries. The ship was tossed toward land by relentless waves before foundering on rocks just off the coast. Founder can be used in many senses to indicate a failure or collapse. Of a person or animal: to founder is to go limp. Of a building: to founder is to fall down or give way. Of a horseback rider: to founder is to fall to the ground. Of livestock: to founder is to become sick from overeating. Of a ship: to founder is to fill with water and sink. What does flounder mean? Flounder has multiple meanings, one of which is a type of fish. The flounder fish is a bottom dweller. Here, though, I will focus on its use as a verb meaning to struggle or to have difficulty, especially in wet or muddy conditions. In this sense, the verb is probably an alteration of founder. A more imaginative explanation might be that the word references the way a fish might flop about after being pulled out of the water by a fisherman. When the teacher called on Mark to solve the math problem, he floundered when answering until so Susi helped him. I saw Marge kneel by the edge of the creek to fill her canteen, so I pushed her into the water and watched her flounder in the shallows. As verbs, these words have some overlap. Someone who founders crashes and burns in utter failure. Someone who flounders struggles, staggers, or shows great confusion. Flounder vs. Founder Check: Notice how flounder and flail each being with the letters FL. Since floundering and flailing are similar actions, you can use the shared letters between these words as a reminder of their meaning. Another way to think of the difference is to think about mud. Yes, mud. One definition of flounder is to struggle or stagger helplessly in water or mud. If you flounder, you don’t necessarily fail completely. You just struggle, as if you were in a thick patch of mud. Just as a patch of mud might slow you down on a bike ride, floundering means you are struggling. Foundering, on the other hand, is to fail completely. Is it flounder or founder? These verbs have some overlap, but careful writers will use them intentionally to communicate exactly their intended meanings. Founder is a verb that means to crash or sink. Flounder is another verb that means to struggle mightily. 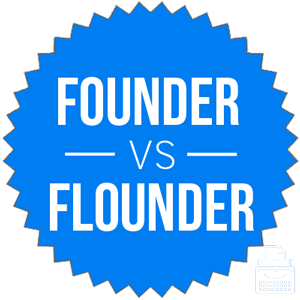 1 What is the Difference Between Founder and Flounder?